We are so excited to have found and be able to offer you a natural alternative to cling film and plastic bags. 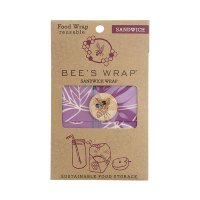 These natural food wraps are made from beeswax, tree resin and organic jojoba oil infused into a hemp and organic cotton cloth. They are ideal for wrapping up sandwiches, packaging cheese, covering salads, cut vegetables and fruit, cold cuts and cooked meat and left overs. 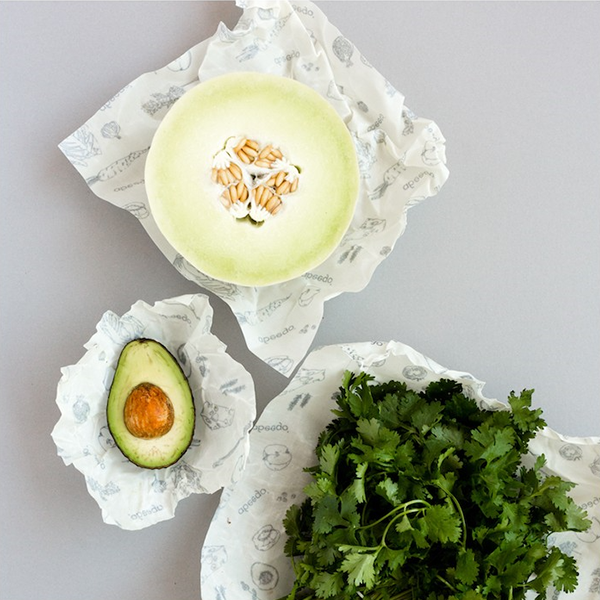 Each Abeego wrap protects food while letting it breathe. It is flexible and slightly adhesive so it can easily be shaped around food and bowls or folded into packages to store food in the fridge, freezer or at room temperature. By simply applying slight pressure in combination with the warmth of your hands enables you to shape it tightly around the item to be stored. It will stiffen when cool, holding the shape you created. The fluid and air resistant beeswax coating keeps food fresh and is easy to clean. Hand wash in COLD water and allow to dry naturally, preferably with a gentle washing up liquid, such as Ecover. In cold water the beeswax coating will be stiff, providing a stable surface to clean. 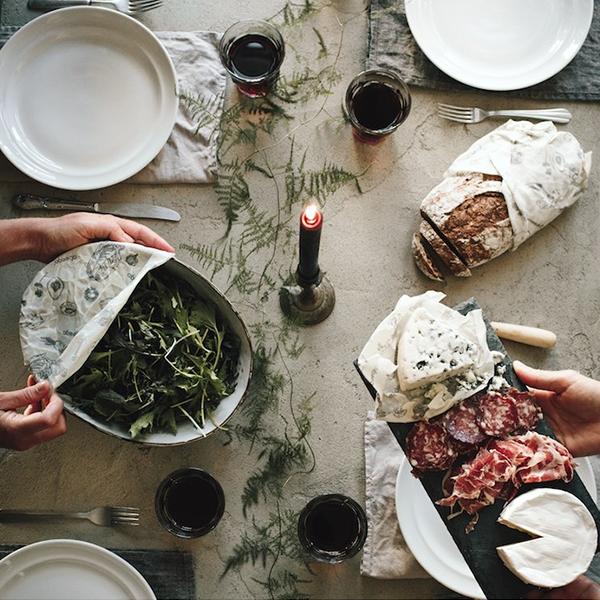 Abeego washes like a plate, not a piece of fabric. It can handle a light scrub with a gentle dishcloth or sponge. Not suitable for the dishwasher, microwave, direct heat or high temperatures. Avoid direct contact with raw meat. Abeego is happy in the freezer for up to a month. To store your Abeego sheets, roll or fold and keep in with your other food packaging or your linen drawer. Keep between cutting boards to store flat. Caring for your Abeego as recommended will ensure that it lasts over a year. When it has finally run its course Abeego can be safely put in your compost bin. Made from hemp and certified organic cotton that has been infused with pure beeswax, certified organic jojoba oil, and tree resin. I really like the product. It is amazing how long it keeps my vegs and fruits fresh! But I found that they only lasted a few uses before the wax-like coating crumbled off. I will purchase again... but wish that they were a bit more durable. I love these! I was surprised at how well they stuck together and kept things fresh. I've got the large one round a melon, medium round a mango and small one round a lemon right now, doing a great job. I have been looking for something to replace plastic film as I wanted something more environmentally friendly. These wraps do an amazing job at keeping food fresh and are so easy to clean and reuse. The smell of beeswax is delicious!